Luca and I connected right away through our shared heritage. We are both half Italian and have a strong connection to our roots. Leading up to the wedding, we shared stories and other information regarding Italy. Luca even promised to help me brush up on my Italian leading up to a visit I will making soon to see my relatives. We also discussed some of his preferences regarding the photography style he was looking for and made decisions about what San Francisco locations we were going to visit on our Photo Tour of the city. After some discussion, we settled on the Golden Gate Bridge, The Palace of Fine Arts and the top of Russian Hill. The Russian Hill location is one of our favorites because it pretty much has an unrestricted view of the downtown skyline. If you are at the correct angle you can also see North Beach and Washington Square. North Beach is notable as being San Francisco's version of "Little Italy" with lots of Italian cafes and restaurants. We are always happy to help our couples choose their San Francisco locations for our City Tour package. We know what areas are more accessible at various times of the day as well as how they might be affected by Summer fog patterns. We do everything we can to try to give our couples the best possible wedding experience. As we have mentioned in other places on this web page, we want our couples to not only enjoy the final wedding photos, but remember the experience fondly. Our best reward after a long shoot with a San Francisco Tour couple (or ANY couple) is when the bride or groom say: "That was fun!" 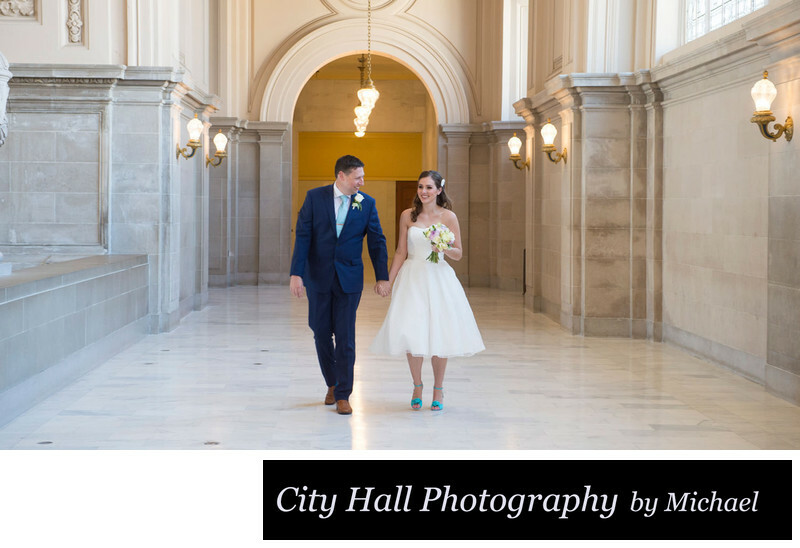 If you are looking for an affordable San Francisco City Hall wedding photographer, you might want to consider this same type of package. It goes well beyond our normal coverage of the interior of the building and a few shots outside. We try very hard to make it into a "San Francisco Experience" using our knowledge of the city as a guide. Our brides and grooms always love it and we often have time to explore around and maybe even get a drink if they would like. 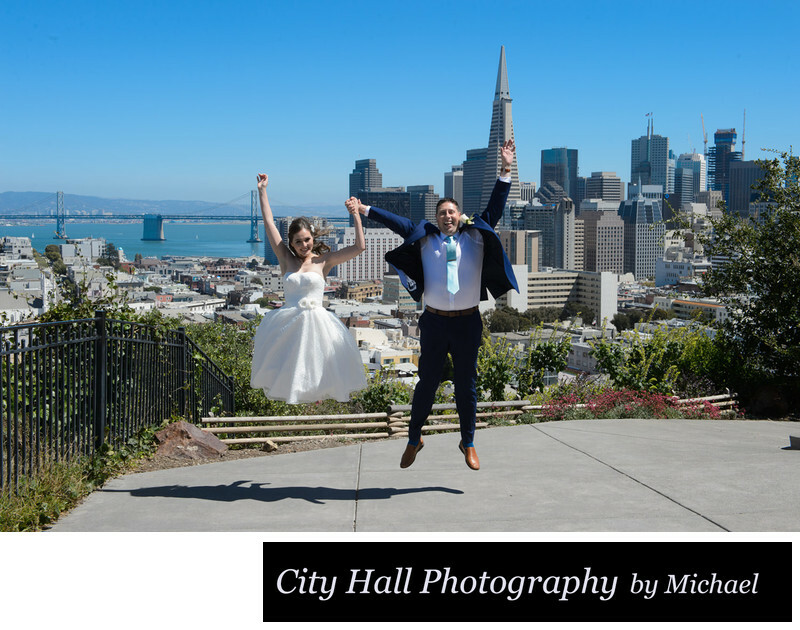 The idea behind this experience goes beyond wedding photography, we hope to make it a fun afternoon of touring this beautiful City By the Bay. For more information on this package check out the video below and please contact us. Below is a very short music video of their San Francisco Photo Tour - Enjoy! Christine and Luca - San Francisco City Tour from Mike Dubnoff on Vimeo. Sometimes the best photos are not posed! The Last Photo of the Day! Woo Hoo! !